Aye, arg, gar! Pull up a peg leg and have a seat, for me be tell'n the tale o' the Scurvy Raider, the finest pirate ship t' sail the sea. Lost one dark and stormy eve, near eighteen years ago, all her crew feared dead or worse. Arrr, but this tale be not ha'in' a sad endin', for the Scurvy Raider has returned t' port with a mighty tale t' tell. The tale o' a dark and stormy eve near eighteen years ago. OK, you know what? Typing Pirate is hard. 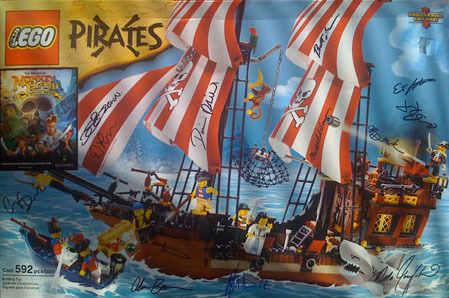 Back when I was working at Lucasfilm, I used to have a giant Lego pirate ship. It sat across from my desk on this low end table and when the nights would grow long and the work day became tiring I would look over at the Scruvy Raider and it would remind me of what we were building; it would remind me of the soul of this game called Monkey Island. Attached to it was a note scribbled on LucasArts stationary that simply said "We found your pirate ship". The Scurvy Raider II has come home, sailing into port for a reunion that onlookers called teary-eyed and joyful. It will once again become a beacon of light into the soul of what we are making. What is four + four + two?